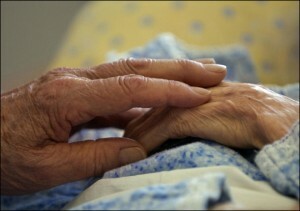 Working at a nursing home, I met a married couple that really defined for me what marriage means. She was an Alzheimer’s victim. Physically, she could do anything I could do. She walked, she ran, and she could maneuver around obstacles. Mentally, she was a different story. She could only follow the simplest instructions and only then when you held her hand, guiding her through it. Once in a blue moon, we’d hear her say “yes” or “no.” Sometimes she’d laugh, but she mostly just stared silently off into space. Together, they were actually pretty independent. He’d be her voice and she’d be his body. She always pushed his wheelchair to meals and activities. He’d instruct her on where to go. She could also do simple things around the room to help him or to help us help him. He’d push the call button for her when he thought she needed something. He’d answer questions for her based on what he knew about her from so many years of marriage. He’d look out for her and make sure she was treated right. I was there when he died. I remember how lost she was those first few weeks. She was thrown off when the staff moved around the furniture to make room for a new resident. Her routine was completely changed around. I think in her own way, somewhere inside her, she knew he was dead. There’s no doubt in my mind though, that it would have been a much uglier situation if she had died first. They meant the world to each other, but he was still mentally aware enough to really know what that meant. They really defined for me “for better or for worse.” They completed each other and helped one another the best they could. In the nursing home, they put each other first. His patience with her and complete devotion to her was inspiring. As much as I hope my husband and I don’t fall apart physically like they did (although God knows we probably will), I hope we do have that kind of care and adoration for each other until the very end.